What a way to knock them off their feet! 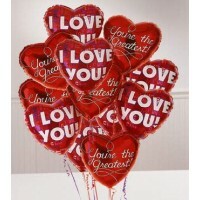 - arrives with One Dozen (Twelve) 18" Mylar Balloons attached to a foil weight, $80. Add a gift bag of chocolates, cookies, and candy to this bouquet, $100. Our designers select the style available, so colours may vary but text will all be "I love you", "Happy Valentine's Day", and other love sentiments and symbols.